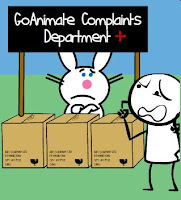 GoAnimate made some major changes to their site mid way through 2010 creating something of a divide when they introduced Premium GoPlus+ accounts. i.e. paid accounts that give you access to more features. Unfortunately what this meant for free GoAnimate users, who now found themselves with a 'Basic' account, was that they lost a lot of things that they used to get for free. A major loss was the ability to mix themes - which now became a Goplus+ feature. Basic account holders also had their animation lengths limited to 2 minutes where as previously there had been no limit. Adding further insult to injury, in order to upgrade a basic account to Goplus+ users needed access to a credit card. With many younger users on site you can imagine the uproar as trying to convince your parents to pay for an upgrade with their credit card is not always the most easiest of tasks. At around the same time GoAnimate started to roll out its Lil' Peepz theme and Character Creator with more momentum, adding a lot of features in the way of backgrounds and costumes and mixing the theme's props into all the other themes. This didn't sit too well with users who wanted to see their favorite themes such as Comedy World, Star Trek or even the Stick Figure theme get some new stuff too. As you can imagine, all of this created a lot of complaining on GoAnimate's Forums and gave me plenty of material to launch into another episode of The GoAnimate Complaints Department with new and improved Plus size desk! This episode borrows a joke from the old Monty Python 'I came here for an Argument' sketch where the customer is belled at the end of 2 minutes, indicating his argument time is over. You'll notice that the Complaints Desk switches from the new and improved desk back to the desk we're all familiar with every now and then. This is because I didn't want the new three window desk to take over from the iconic desk that everyone is familiar with. The old three boxes desk is as much an icon of the series as Happy Bunny is working behind it. There are a couple of other references thrown in there such as Ken's assertion that people are gaming the Top Animations page. This was actually happening as many unscrupulous members realized you could bump up your animations position in Top Animations by recommending it from multiple 'fake' accounts set up specifically for the purpose recommending animations in a users main account. The Zombie joke was one I threw in there because there was a real trend for making Zombie animations (big enough for the Comedy World Character Creator to receive some Zombie outfits and heads). There were so many zombie apocalypse animations I figured the zombies must've been getting tired of being portrayed in such a stereotypical way. In general I was very happy with this episode because almost all the jokes were inspired by real complaints - which is why people enjoy the series so much. It's also why occasionally I get comments on the animation from people who really do agree with the complaints being made. It was a bold move that GoAnimate made, taking things away that used to be free, however it is the strength of the application that people didn't leave in waves of disgust. I'm sure a few people did leave but the ones who really liked the site... I doubt they stayed away for long.